This is another strong pillar for the world's music reference libraries and the shelves of serious enthusiasts. It will have a strong appeal to dedicated students of US music of the twentieth century as well as those who specialise in the cruel pilgrimage female composers have had to make. 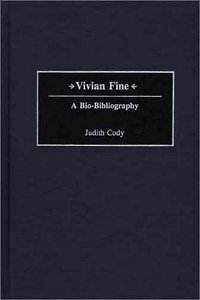 Vivian Fine was born on 28 September 1913 in Chicago, Illinois. She was befriended by another and better connected composer, Ruth Crawford. In 1932 her Four Polyphonic Piano Pieces showed up in the First Festival of Contemporary American Music at Saratoga Springs, upstate New York. By the mid-1930s Fine was working with many women choreographers. At about this time she began lessons with Sessions and Georg Szell. Her style was mostly atonal. She looked back on her spell at Bennington College, Vermont as one of the most fruitful times of her life. The apex of her career came with Drama for Orchestra - an SFSO commission. This is a work suggested by a group of paintings by Edvard Munch. She retired from Bennington in 1987. Vivian was killed in a car accident on 20 March 2000. Bear in mind that this is primarily a reference work. That said there is a very personable introduction and a 30 page biography that is just about ideal in its mix of historical incident and communicative musical description. From there you can jump off into the annotated bibliography (completed with extracts from the writings listed), a catalogue of her works and performances, a list of her performances as a pianist, a discography (only 21 entries), a chronology year by year. The appendices tell us where to find Fine's music, names and addresses of publishers etc (I wish there had been more in the way of e-mail contacts and web addresses), analysis of creativity, list of teachers, alphabetical and generic lists of works, settings of poetry by author and an index running to 21pp. The index has entries by place, institution, people, publication title etc. Judith Cody has given shape and organisation to her subjects' output by giving each work a JC number rather like the Mozart Köchel numbers. The book is a middle-large size format sturdily case-bound as is the hallmark of Greenwood Press books. The usual matte cream-white paper stock is used and by now they have moved away from the courier font and employ times-roman or something closely related. Ms Cody says that 'this book is designed to be as accessible as possible to all those who love music'. Her design has been accomplished and the book will open the way to Fine scholars the world over as well as shedding illumination for enthusiasts of Fine's music.